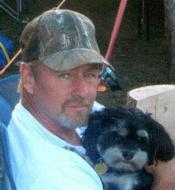 Michael Saunders, 55, of Kaysville, Utah, passed away on October 25, 2013. He was born in Logan on December 2, 1957 to Merlin Saunders and Venna Walker. He married Sherril Dawn Perry on January 5, 1979 in Hyrum and the marriage was later solemnized in the Logan Temple. Mike was reared and educated in Logan for the first thirty years of his life, where he met and married his sweetheart, Sherril. He has lived in Kaysville for the last sixteen years and was an active member of the Barnes Park Ward. Mike worked at Thiokol/ATK for most of his adult life. He loved designing and building anything. When anyone needed anything, he was the first one there. He enjoyed working in his yard and growing a garden to share with everyone! He was an avid hunter who loved the outdoors, but his greatest loves were his wife, his children, and his grandchildren. He is survived by his wife and children, Anthony (Emily) Saunders, Jason Saunders, Misty Jensen, and ten grandchildren, Natalyn, Ashton, Kianna, Keeli, Madie, Alexa, Logan, A.J., and Evan. Mike is also survived by his parents and siblings, Kurt (Alice) Saunders, Paul (Lorene) Saunders, and Sharon (Rod) Larsen; in-laws, Ivan and Sharren Perry; and many other brothers and sisters-in-law, and nieces and nephews who he loved. He was preceded in death by his sister, Barbara, his grandparents, and his sweetheart grandma, Elsie Perry. Funeral services will be held Tuesday, October 29, 2013 at 11:00 a.m. in the Flint Street Chapel, 200 N. 1275 W., Kaysville. Friends may visit family from 9:30 a.m. to 10:30 a.m. prior to the services, and from 6:00 p.m. to 8:00 p.m. Monday, October 28 at Lindquist’s Kaysville Mortuary, 410 N. Main Street. Mike always impressed me as being someone who looked for the best in others. I remember him as being genuinly kind and approachable. Thoughts and prayers go out to family.